With persistent chat in Lync, the whole conversation history of a chat room, from the first message to the most recent, is saved in the chat room window. You can browse through all the messages, or, if you know what you’re looking for, use search to track down messages about a specific topic in one chat room, or in all the chat rooms you’re a member of or follow. Also, you can set up search to find messages posted only by a certain person or people, and/or during certain dates. Drag the scroll bar up or click the up arrow, until you reach the top of the message listings. Date The first message that’s posted on a given day receives that date as a heading. Name The name of the person who posted the message is used as a subheading that also includes the time. Time The time of the posting is included with the name in the subheading. If the post contains multiple messages, the time of the last message posted is used. Click the Search button in the lower-left corner of the chat room window . This opens the Search Chat Room History dialog box. In the text box below What would you like to find, type the word or words you want to search for. To search for any of the words you typed, click Match All words. To search for the exact phrase, click Match Exact Phrase. By default, under What rooms do you want to search, the name of the chat room you’re currently in is selected. But you can have Lync search across multiple chat rooms instead of only this one. 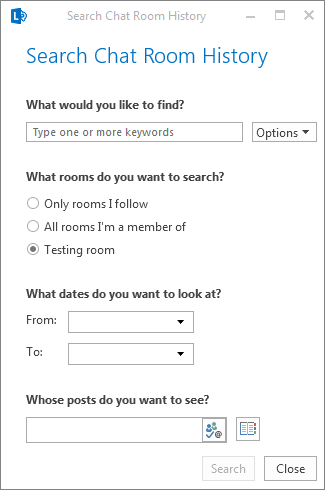 Click Only rooms I follow to apply to rooms you follow, or click All rooms I’m a member of to search all the rooms on your Member Of list (which includes those you follow). (Optional) If you want to search only for messages from around a certain time, under What dates do you want to look at, select dates. Otherwise, Lync will search all chat history. (Optional) If you want to search only for messages from a specific person or people, under Whose posts do you want to see, type a name or email alias. 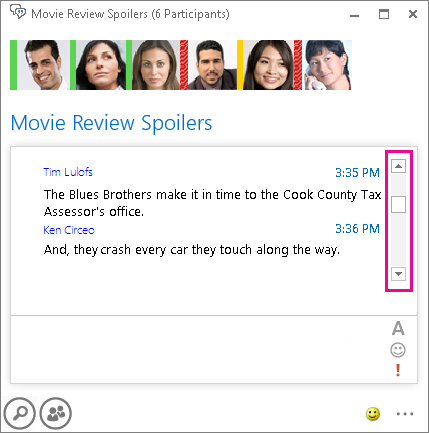 If you skip this step, Lync searches everyone’s messages. To start the search, click the Search button or press the Enter key. Search results appear on the right side of the Search Chat Room History dialog box. If the search comes up empty, you’ll see the message “No matches found” in the display area. Tip: To see the message in context, in search results, note the date, click the chat room name, and then use the date to browse for the message. For details about browsing, see the previous procedure.